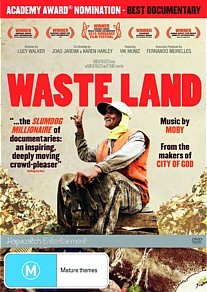 Waste Land DVD Review Waste Land is a work of extraordinary poignancy, and the journey one takes in watching these humbled people experience the redemptive power of art is truly magical. Almost three years in the making, this recent outing from renowned documentarian Lucy Walker (Devil’s Playground, Blindsight) has received a unanimously rapturous response, currently holding a 100% approval rating on the aggregate review site Rotten Tomatoes and widely hailed as a compelling, thought-provoking and ultimately uplifting celebration of the transformative power of artistic expression. The film follows renowned New York based artist Vik Muniz as he travels back to his homeland of Brazil, or more specifically to the titular waste land of Jardim Gramarcho, one of the world’s largest landfills. The acres-wide dump collected 70% of the waste of the city of Rio, and among its army of workers were a group known colloquially as pickers. Employed by various Brazilian firms to harvest recyclables from the mountains of trash, they spent their days sorting through piles of refuse, working, eating and sleeping on the singularly pungent site itself or renting shacks in the nearby shanty towns, a favourite refuge of drug dealers, gunmen and lowlifes. Over the course of the two years Muniz grew close with many of Jardim Gramarcho’s central characters, photographing them and inviting them to help construct giant murals from the detritus of the landfill. The resultant artworks were then sold at auction, and altogether raised over a quarter of a million dollars for the pickers, their families and their collective the ACAMJG. Waste Land is a work of extraordinary poignancy, and the journey one takes in watching these humbled people experience the redemptive power of art is truly magical.